Property Information: El Meridiano M.D. which constitutes 2970 Hectares lies in the western part of an 8-10 km wide caldera, and the western most part of this feature is thought to be the site of a 2.5 km wide circular diatreme complex. Andesitic to felsic tuffs in a 4 sq. km area are cut by gold-bearing hydrothermal breccias filling N to NW trending fractures and faults. Virtually all samples of these breccias contain small to significant amounts of gold, arsenic and antimony, but very little silver or base metals, suggesting that the mineralization is preserved at a high level of erosion. Geology: Drilling was carried out on the project in 2009 and 2010 by a previous operator. Work carried out included 403 rock chip samples, 65 line-km of magnetic and 32.5 line-km of gradient array IP ground surveys and 32 drill holes. The drilling totals 4,698m in two reverse circulation campaigns and one diamond core twin-hole campaign. The drill holes were collared within a 1 sq. km area in the northwestern-most part of the property. 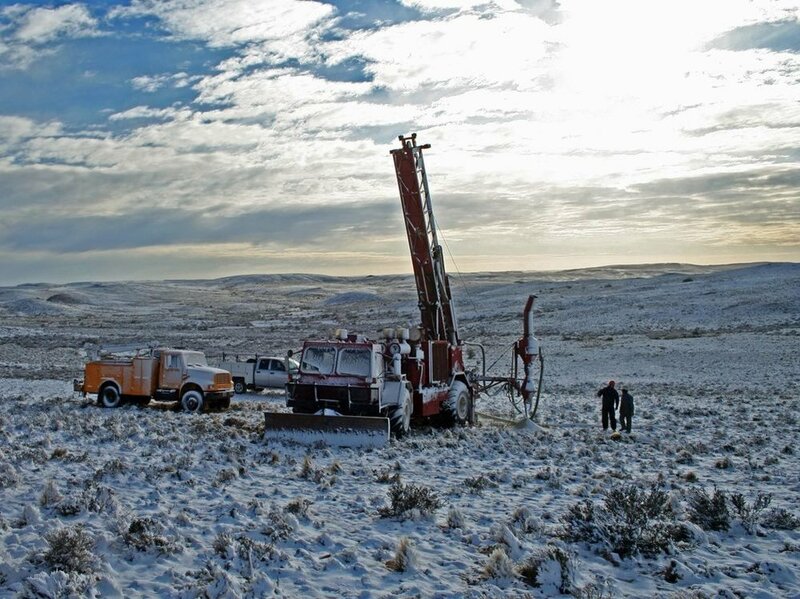 Historic drill results included multiple intercepts of weak gold mineralization. Most holes hit one to several thin intervals of at least 0.10 ppm Au, and about one-third intersected wider intervals of weak mineralization interspersed with narrower higher-grade zones. Ten holes intersected “significant mineralization,” here considered to be the equivalent of 1.5 meters (true thickness) of at least 0.34 ppm Au). Note: The mineral intercepts reported above are at an angle to the steeply dipping structural zones. Most holes hit one to several discrete intervals of at least 100 ppb Au and about one-third intersected wider intervals of weak mineralization interspersed with narrower higher-grade zones. 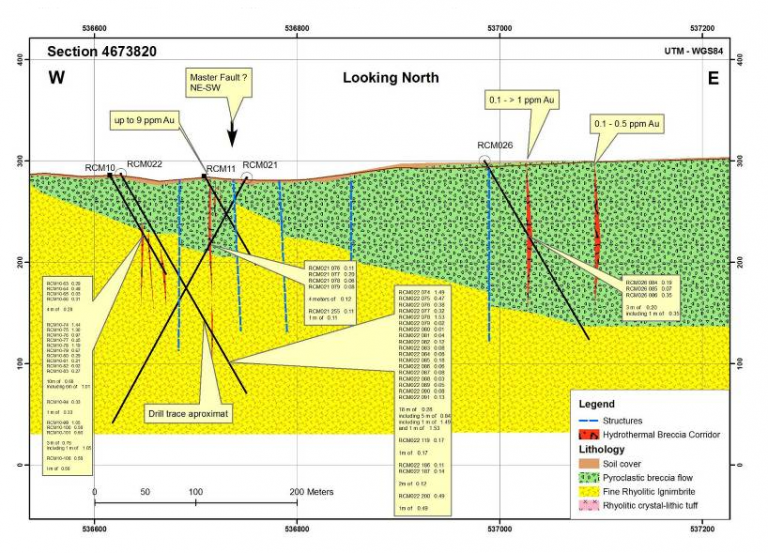 Ten holes intersected “significant mineralization”, here considered to be the equivalent of 1.5 meters (true thickness) of at least 340 ppb (See Renaissance Gold Press Release dated Dec 20, 2010). We are currently planning a CSAMT survey to supplement previous ground magnetic and gradient array surveys in defining the flanks of the diatreme and the optimal drilling depth.